By Caz | March 20, 2019 | This post may contain affiliate links, which means we may receive a small commission, at no cost to you, if you make a purchase through a link. Read our Disclosure. We weren’t intending on visiting Vegas on our America Unplugged road trip. Our intention on this trip is to go beyond the main tourist destinations that everyone knows, and strangely, wants to visit. But, since we were close by, and our Australian readers insist on incorporating Vegas into their travel plans, we decided why not? I wasn’t expecting to have a great time – I mean how long can you spend looking at casinos before you get bored? But, I arrived intending to have a great time and see Vegas in a different way. Guess what? I had a good time! Attitude is everything. My girls love the excitement of a big city and one that has a three story M&M’s world and all you can eat buffets with loads of dessert options will inflate the heart of any child. One thing I did enjoy about Vegas was the later starts we could have exploring each day as Vegas is more of an evening/ night time place. It meant I could get some work done , exercise and even have a podcast interview! We had three nights in Vegas before moving to St George in Utah. 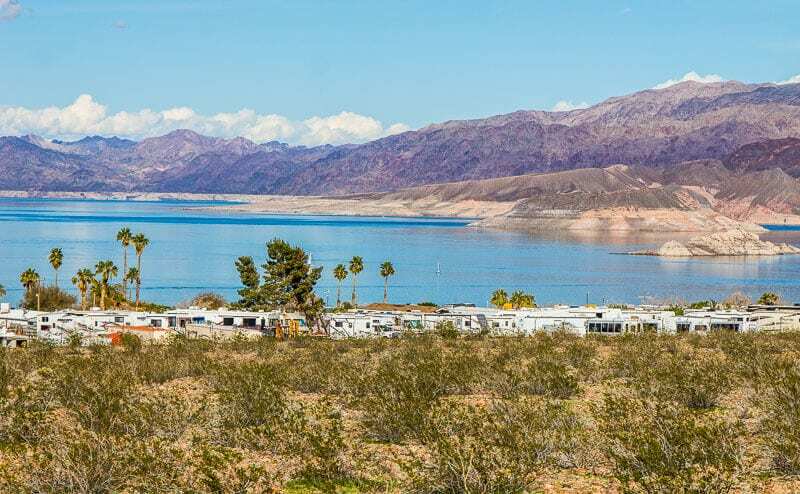 We had a couple of down days before Vegas at Lake Mead to enjoy those lakeside views while we planned out, and booked the next month! I also used it as an opportunity to spring clean Goldie – it’s amazing how many things end up getting stuffed into cupboards, and I caught up on loads of work which is so satisfying I can’t stand having tasks piling up around me. It’s important to take down days on your travel to avoid this clutter and overwhelm. This week 15 wrap up of our USA road trip shares our adventures from Saturday to Friday. I publish the posts on Sunday (I need a few days to prepare it!) More in-depth posts on each region with loads of tips and suggestions will be coming soon. Be sure to follow us on Instagram and Facebook where we share the current day-to-day adventures. Where did we stay in Vegas? Except to spend hours and miles walking The Strip. It is fascinating to see the bizarre lengths the casinos have gone to attract customers. Kalyra and I had great discussions about the designs of casino floors purposefully done to trap and confuse people so they sit there all day and night donating their money to Casino bosses. I personally preferred the class and elegance of hotels like Wynn and Bellagio to the fake cities of Paris, Venice and Ancient Rome. What’s your favorite Strip casino? Of course, we indulged in the Paris buffet, had an overpriced drink at the Mirage and enjoyed the kitschy volcano erupting show! Ah Vegas! What? You went to Downtown Vegas? You may be thinking we’re mad, (definitely) but Downtown Vegas is not the seedy and dangerous place it once was. The last 5 years has seen the beginnings of change and exciting revitalisation. It has so many parallels it Downtown LA which was once a dangerous place but is now, I think, one of the most exciting and unknown US city destination. Downtown Vegas is on the cusp of that greatness. Just remember you heard it here first. Visitors there used to confine themselves to the boundaries of the covered Fremont St, but now they are walking beyond to discover more. We will be taking our friends there as we uncovered a few cool things to do like axe throwing, $12 buffets and $2.50 beers. I’ve always had a weird kind of fascinating and fear of the Mob. What with the Godfather, Donnie Brasco and Al Capone how can you not be? Whereas Chicago tries to hide their checkered Gangster past, Vegas is like, hey baby this was part of our growth and look at how we overcame it. Put aside a couple of hours at the Mob Museum. We didn’t and I regret it. IT was a quick whirlwind tour through as we had our walking tour booked in. But, the quick ended up being good for the girls. They were okay with learning about the Mob until unexpectantly coming across some gruesome footage and then we quickly escorted them out. So, perhaps it’s not the best place for your kids. It definitely opened up a good conversation about organized crime. I think I can trust that neither of them will ever get mixed up in it. I think I made them promise me several times! The museum is three floors of exhibits and stories, films and photos. One section will warn you of the gruesomeness to come. 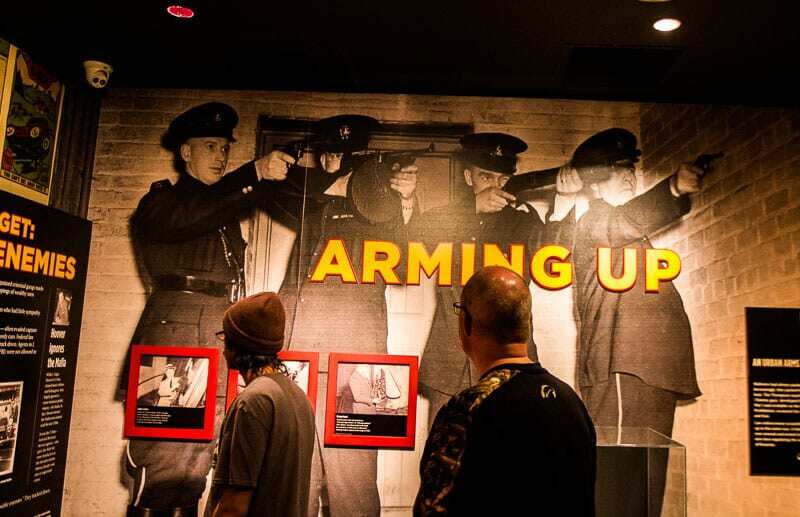 The Mob Museum was part of our Sightseeing Pass, which also included two special exhibits: The Crime Lab and the Use of Force. I was disappointed we ran out of team for the 30 minute crime lab. Craig and I had to tag team as no there is an age limit. But the Use of Force was a quick and very interesting 15 minute insight into the stainless steel nerves and quick thing police officers have. It did involve shooting a few of the criminals. I was shot first once and the second time I got the guy. No innocents were harmed in my scenario – Craig’s was a different story. we even had a real life drunk we had to encounter and disarm. I wouldn’t be a cop for anything! This is why I travel. To be surprised and find those America Unplugged secrets. This is also why I love to take these kind of tours. You learn so much from the local guides that you never would from just wandering around yourself. You only can see what’s in front of you, but a guide can tell you the story behind it. IT’s stories we relate to and connect with. 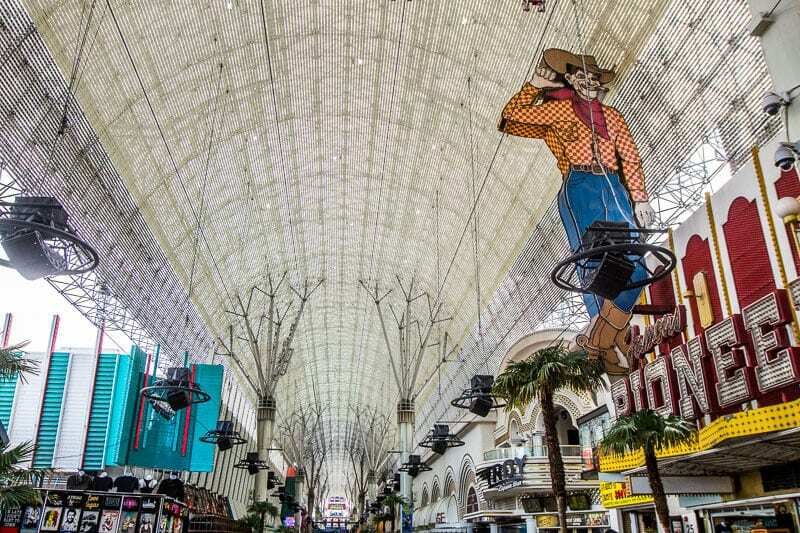 We learned about the birthplace of Vegas, (which is near the Plaza hotel at the beginning of Fremont St), how and why the casinos go up and down so much, the history behind its growth and allure, and the revitalization of Fremont St, the surrounding area, and the very cool local Downtown East. 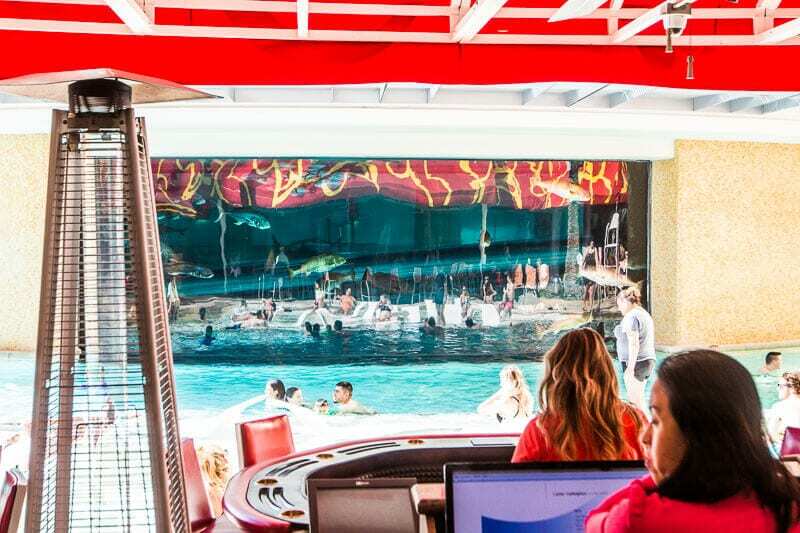 We loved checking out the Golden Nugget pool with the aquarium in the middle with the water slide that goes through it. IT’s been named as one of the top 10 pools in the world by Travel & Leisure. In downtown there are many high class restaurants at affordable prices and loads of cheap drinks. I love that our guide gave us a print out of his recommended places to eat and drink and when you can find the cheap prices. This was included on our Las Vegas Sightseeing Pass. You can get yours here. 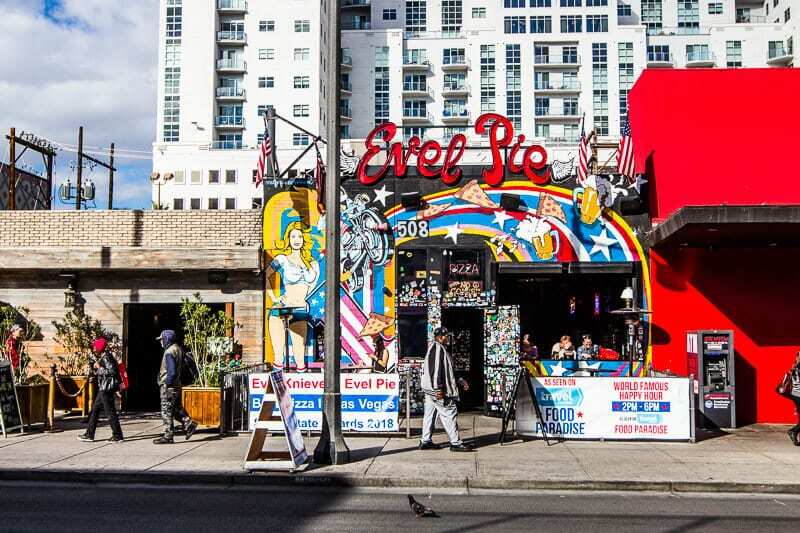 Downtown east is the vision of Tony Hsieh, the founder of Zappos. 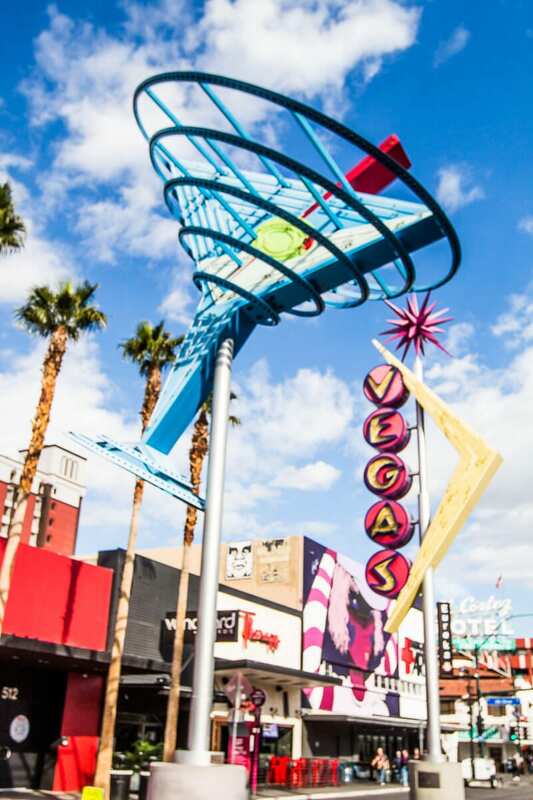 He launched Downtown Project as a $350 million downtown Las Vegas initiative to redevelop a section of downtown from Fremont Street Experience to Maryland Parkway along the Fremont Street corridor. He decided that he was going to bring 5,000 jobs to this region and revitalize it into a local’s neighborhood with cool restaurants, breweries and places to hang out. He has certainly done this. It started with him starting all the restaurants etc. himself and bringing the headquarters of Zappos to Downtown, but hey when you have vision, you find the solution. 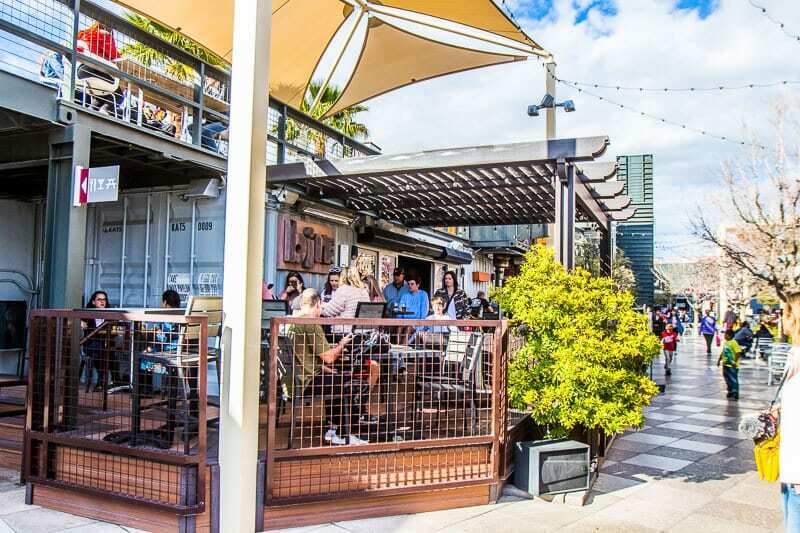 The Downtown Container Park is a wonderful family friendly area for locals to hang out with cafes, boutiques stores, craft-whiskey cocktail bar, bars, and outdoor stage and treehouse playground for the kids. It features more than 40 repurposed shipping containers that house retail shops and restaurants. The center is intended to be a starting place for promising entrepreneurs who have longed to open a shop or restaurant. So I’m not really a magic person. I kind of enjoy it at the time but I tend to drag my feet there for some reason. I dragged my feet yet again to Matt Franco’s Magic Reinvented Nightly at the LINQ Casino. 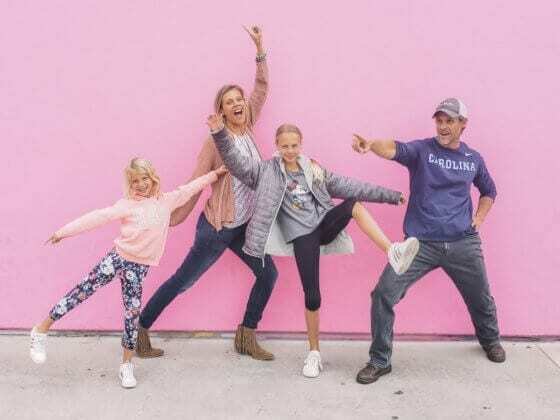 We went because it was a premium experience on our Sightseeing Pass and the girls love magic, especially what they see on America’s Got Talent. Matt won it in 2014. It was the BEST experience we had in Vegas. I loved this show so much. The magic tricks were awesome, but his presentation was funny and heartwarming. His storytelling drew us in and made it an incredible experience. What I loved the most was seeing the girls giggle the entire time, jump off out of their seats with hands in the air, clapping and cheering. By the end of it Savannah had her hand straight up trying to get on stage as a volunteer where at the beginning she was begging me to put mine down. It was a night purely just to enjoy magic. It didn’t matter the trick and sleight of hands as to how it was done, we could just believe in magic. It surrounds us everywhere, everyday, some are good at plucking it out of thin air in many different forms. The girls also love gymnastics and acrobatics. 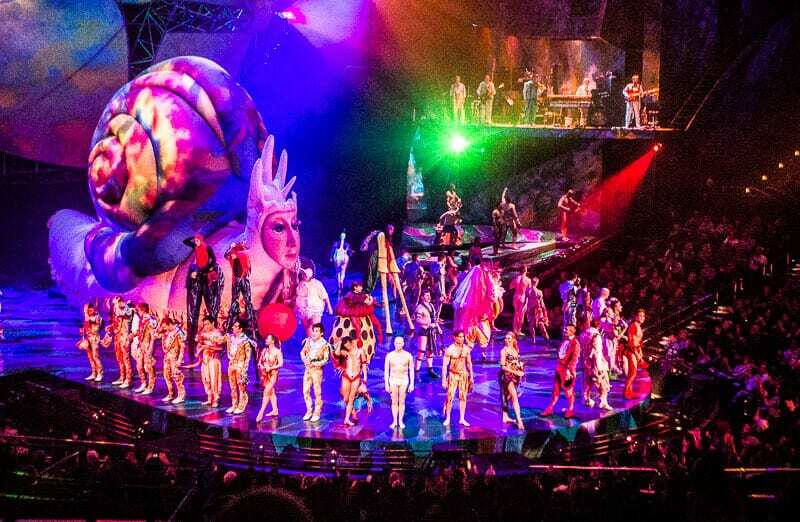 Cirque Du Soleil is a show that I’ve wanted to see since they become Cirque Du Soleil in Vegas. They have so many different version of the show at different hotels. We were told Mystere is the longest running. most popular, and best for kids. 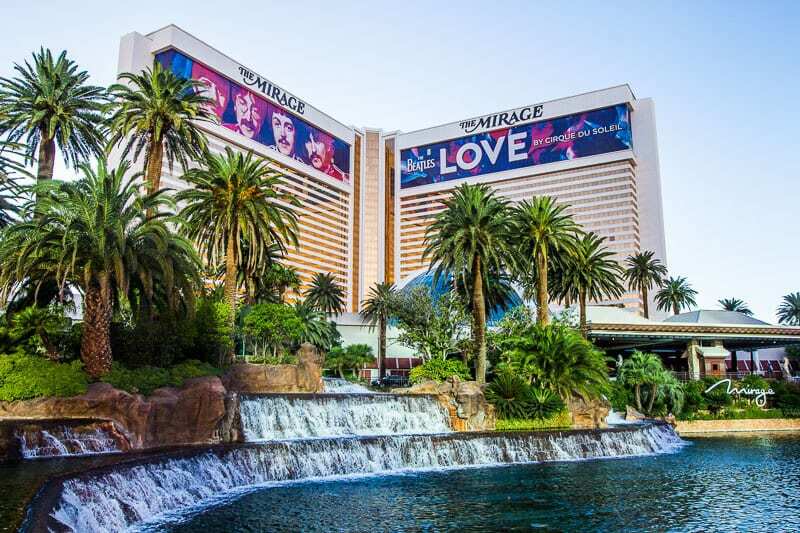 We found the best deal on Vegas.com – thanks to Johnny Jet for that tip. It’s in Treasure Island Casino. The theater is small enough to have good viewing seats no matter where you are. It was fantastic. The tricks and costumes were phenomenal as was the strength of the performers. It inspired me to do more core workouts. No one seemed to have an idea of what the storyline was but it gave the girls and I a good opportunity for discussion and sharing our creative ideas. We thought it was showcasing the cycle of life and the different acts represented earth, fire, wind and rain. Have you been? Do you have an idea? As tumblers, the girls loved this act the best. The trapeze act was also good. And hey, who wouldn’t love a circus that uses NO live animals? This week the hook came off our sway bar while we were driving. Luckily we stopped to refuel and noticed it!! Camping World is becoming a place we frequently visit for repairs and replacements! Timing mail delivery is a challenge. 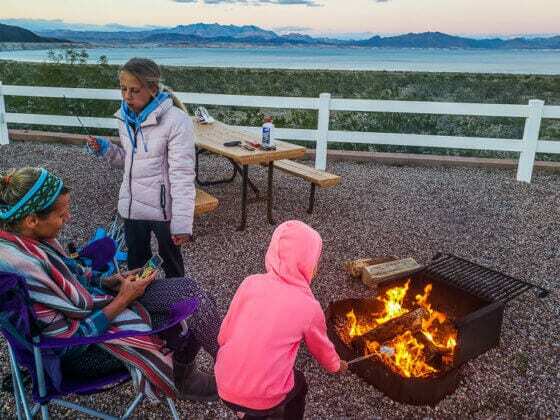 You have to account for delivery time and know you’ll be at a campsite that accepts mail for you, and at the right time for delivery. Thankfully, since we have finally booked accommodation for a month in advance, I was able to madly order everything I want for the next few months. Thrive Market is my go to online shopping portal for organic food at an affordable price. I put in a bulk order for the next couple of months. I’m so excited to get it, especially the organic wine which is exceptional. Click here to get 25% off your first order. If you are leaving the RV to stay in a hotel in Vegas, check with your hotel as they may have adequate parking for your RV. After spending some time phoning fully-booked dry storage places we decided to just ask the Excalibur just in case. Yep. They have a separate parking section for trucks! It cost $20 a day but that also covered The Beast and we could park her at any of the MGM hotels in Vegas. It’s best to plan your departure from your RV into a hotel with little food in the fridge. Thankfully we were almost all out. What we had left we piled into the esky (cooler) and filled it up with ice from the ice machine in the hotel. It kept everything cool and okay. You have to pay $25 for a fridge in the hotel, and it would have been too small anyway. Vegas hotel fees are ridiculous. They have a fee for everything so be aware. 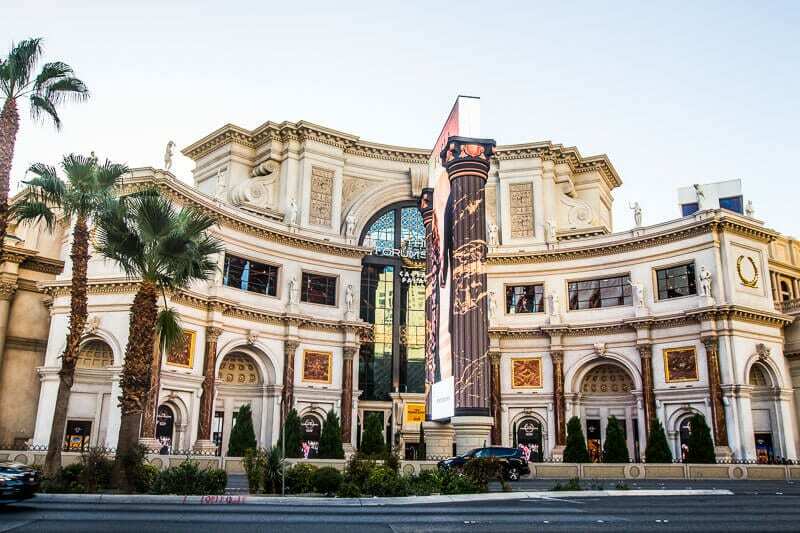 We will write a separate post to help you choose your Vegas hotel. We’ve had experience in about 5 of them now! 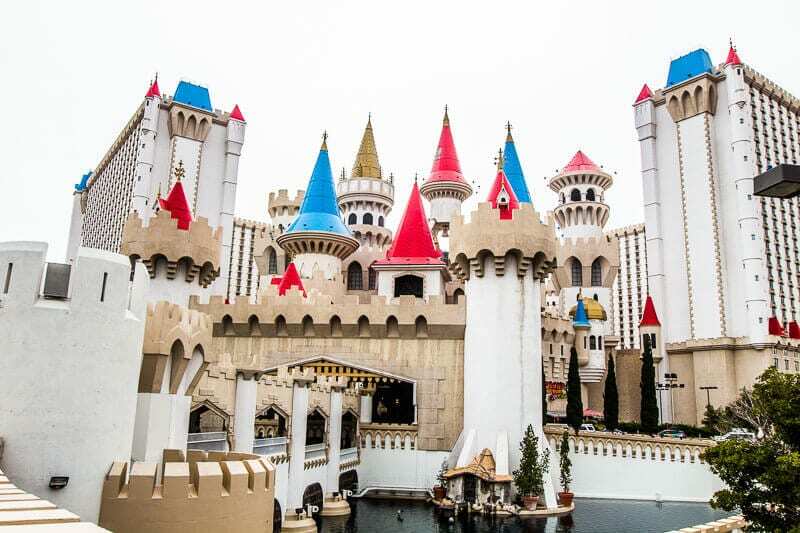 The Las Vegas Sightseeing Pass, which is a city attractions pass that offers savings on popular attractions. We’ve used them for New York, LA, and New Orleans and find they offer great savings. They even have a USA pass if you plan to travel through multiple US cities in 30 days. We work with The Sightseeing Pass as affiliate partners and they provide us with the passes. We share them because they offer great savings. We’ll be doing more of the attractions on the pass when we visit Vegas. We had a couple more nights at this beautiful RV park. You can read more about it in last week’s post and TripAdvisor reviews here. We weren’t looking for fancy when choosing our Vegas hotel – just something cheap on the strip and a basic room. You’re hardly in it anyhow. Excalibur ended up being the cheapest we could find. It’s at the southern end of the stirp, which wasn’t ideal. we prefer the center but it was only a 30 minute walk. I like walking, especially in Vegas so I was okay with it. The Excalibur is a good option for lower budget. We did have to step over a pile of vomit on the casino walkway one morning, but they cleaned it pretty fast, and hey your in Vegas! 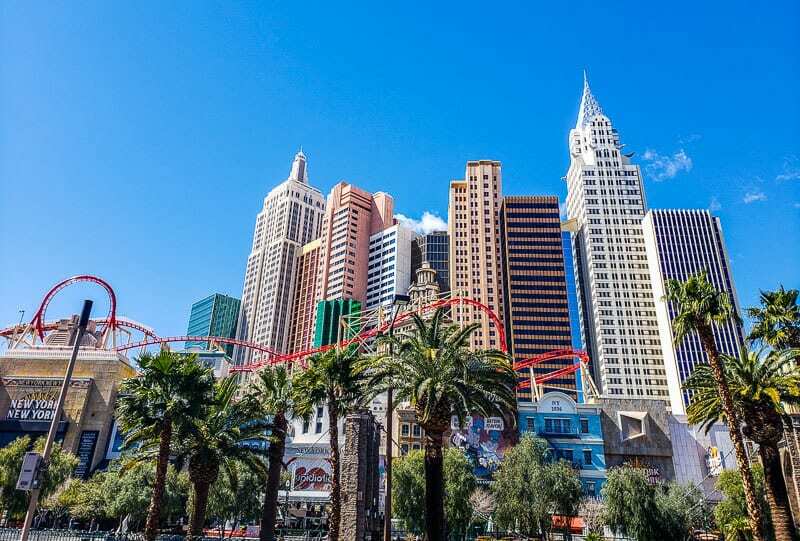 If I was going to Vegas just on a getaway and not part of a year long trip, my Vegas Hotels of choice would be Bellagio, Wynns, Flamingo, and the Mirage. Each week, I include our travel related costs for the week. I don’t include things like business costs, insurance, and souvenirs etc. That’s so personal that whatever I told you wouldn’t necessarily be true for you and your budget. The following, apart from perhaps our groceries, will give you a reasonable estimate of costs related to travel. My 30 days to Money Mindfulness Course helps you learn how to master your money (and do things like weekly spending checks no matter how much they hurt!) You can’t change what you aren’t aware of. 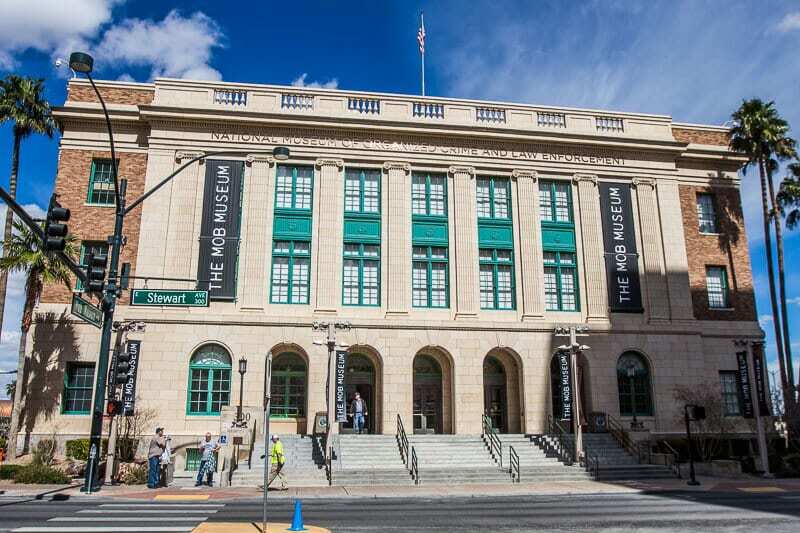 * For the above Downtown Walking Tour ($104), Mob Museum ($101 Savannah was free) and Matt Franco Magic Show ($332) it would have cost $537 total to purchase them individually (family of 2 adults 2 kids). It’s worth noting that the children’s pass for Vegas cost the same as the adults. I think this is because Vegas has mostly “Adult” attractions. There are many the kids can still do though, including some of the night shows. It’s worth thinking about. Definitely do careful research so you know you’ll get the savings from it. Note that the Sightseeing Pass was covered for us. Don’t forget with eating out costs, tip will be included in the prices and the odd glass of wine or two. Once again, city exploring ripped our budget apart. Take out the Thrive bulk buy and Mystere and we did pretty good for Vegas. So you know the effort and investment we put into creating epic content! We’re in the St George area for a few nights exploring a couple of state parks. We’ll then move to Zion National Park for a few days before returning back to Vegas! Yep. We’ll have another week in the Vegas area. We have friends from Raleigh flying in to spend time with us. We’re all excited about that, especially the girls, as they’ll have their two girlfriends to play with again. You can find our previous RV weekly wrap posts here. Videos of the trip coming out soon. Subscribe to our channel so you don’t miss it. We’re now releasing our road trip videos.